It should work on any Matrix-1000 but I strongly recommend you to upgrade to firmware v1.20 from Bob Grieb or v1.16 from GliGli. 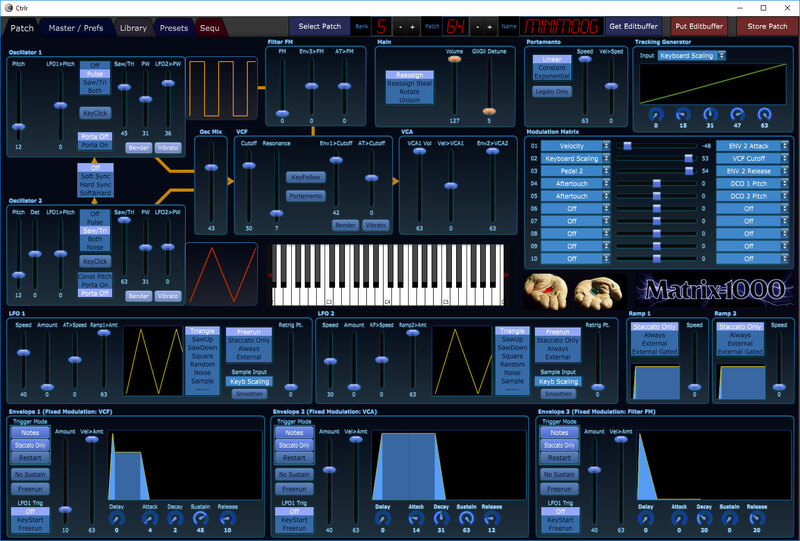 I am using v1.20 which is an awesome upgrade for the Matrix1000. You don’t have to ask for this panel anymore – I just ask you to read read this text carefully before you go to the download site. The Matrix-1000 panel has not been reported to be problematic, but nevertheless keep in mind that this panel is still in beta state. Beta means that the software is not fully tested and there may be bugs which have not been discovered yet. Therefore, everybody who is using this panel is a beta-tester not an end-user. Don’t get me wrong. 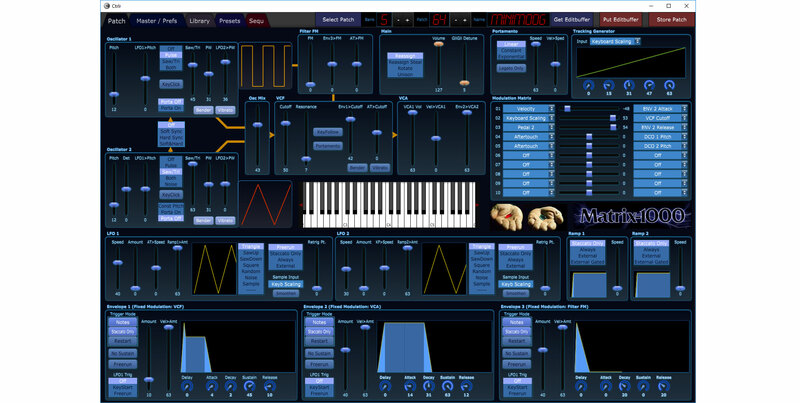 Bug-reports and suggestions of any kind are very welcome, but I won’t accept blaming me of having problems with your synth (e.g. 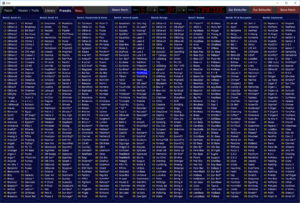 losing data) as a result of using this panel. This is a risk you are taking on your own when you are using it. I recommend saving your patches before using this panel. This can be done with a sysex tool. There are reliable freeware tools to do this. If you need help saving your patches let me know. This Matrix-1000 panel has been developed for firmware v1.20 from Bob Grieb. People reported that it works ok with v1.16 from GliGli too. Other firmware versions haven’t been tested. v1.11 was the last official firmware from Oberheim. It contains some bugs but apart from that it should work as well. Be aware that with firmware v1.03 you may run into problems. Either do the needed hardware modification and upgrade to a higher firmware or maybe forget about using editors/librarians (look at Bob Grieb’s page, scroll down to the bottom). The Matrix-1000 is almost identical to the Matrix-6. 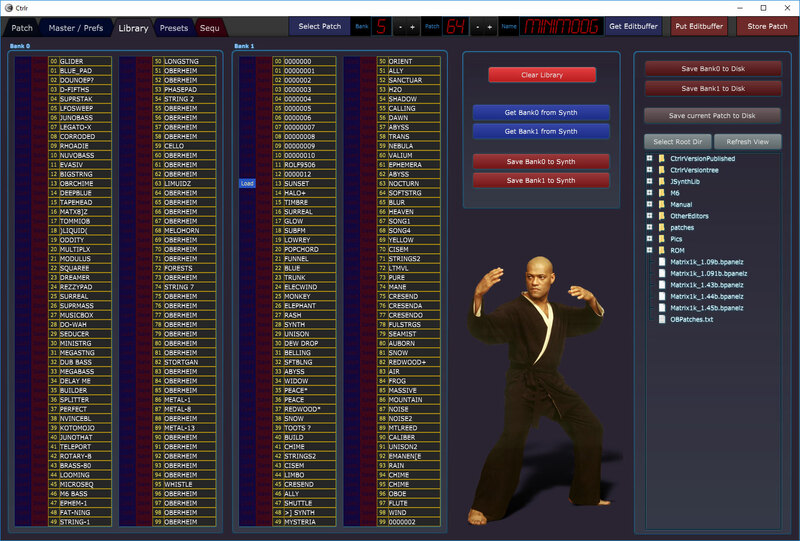 You can load Matrix-6 patches and banks into the Matrix-1000 and vice versa. BUT the Matrix-1000 cannot save patch names. 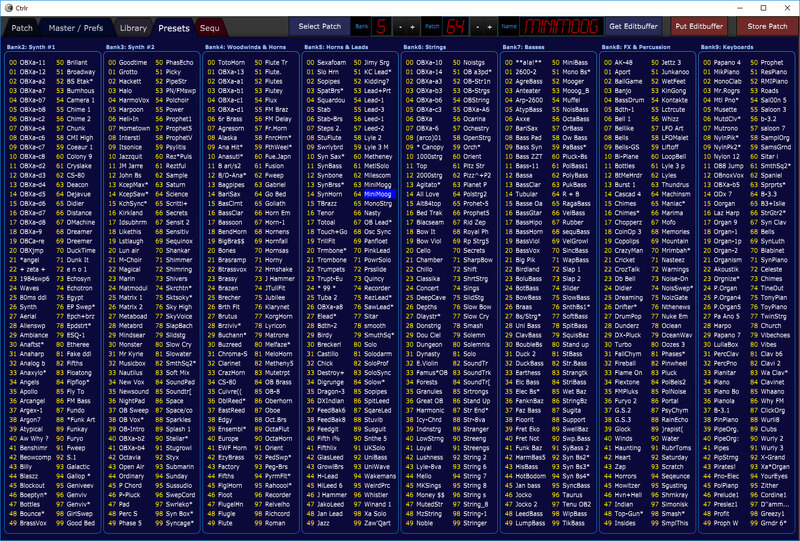 Therefore, when you load a patch or a bank from the Matrix-1000 into the panel it won’t show a name. When you save banks or single patches to disk the names will be preserved. 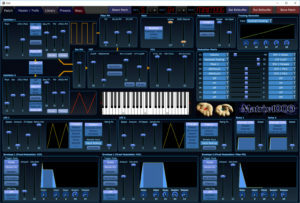 One user had problems sending banks to the synth. This was due to the 10ms delay between patch sysex messages being too short for his setup. He successfully tested a version with a 100ms delay. 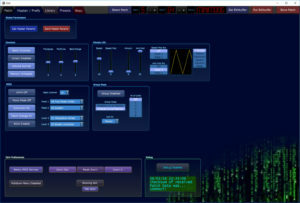 On the actual version the delay is now customizable. Look at the Master/Prefs tab. If you have some Ctrlr / Matrix related questions, suggestions or concerns: roet32(at)gmail.com. 1. Sytem Reset: hold the “Enter” button while switching on. It will show the firmware version. Wait until device starts up. Patch 00 of Bank 0 will be initialized to an init patch. 2. Calibration Procedure: Select “Ext Funct”, push button 7, push Enter, push Enter again. Display will show “CAL”. Wait until device reverts to Patch mode. 3. If you are using firmware v1.16 or v1.20 maybe GliGli-Detune is set by accident. Set it by using CC 94, or use my Ctrlr panel. GliGli-Detune is not saved with the patch parameters. 4. If you are using an old Oberheim firmware (e.g. v1.11) you will face a load of bugs. Upgrade to a bugfixed/enhanced firmware. If you live in europe you can get a ROM chip programmed with v1.20 from Untergeek. Within the USA you can get it directly from Bob Grieb: Tauntek Website. 5. Master Parameters may not be set correctly. Use my panel to set it to your preferences. 6. If this did not help you may have a hardware prob. Common issue: memory backup battery’s life has ended. Replace it with a new one. For this you will have to desolder the old battery. 7. If this still does not help you may have a faulty CEM3396. The “small body” CEM3396’s used in the Matrix1000 are getting rare. The “wide body’s” used in the Matrix6 are still available for about 6$. There are ways fitting a “wide body” into a Matrix1000 (i mean without using a sledgehammer). REALLY cool panel mate! Love your work. Running it on OSX Yosemite with the latest CTRLR build for OSX. I am having some technical issues (e.g. Bank select is working fine but Patch Change messages don’t seem to reach the synth even thought Patch Enable mode is on in Global) and can’t get some of the bulk SysEx dump/receive functions to work properly yet however it’s early days of experimenting. 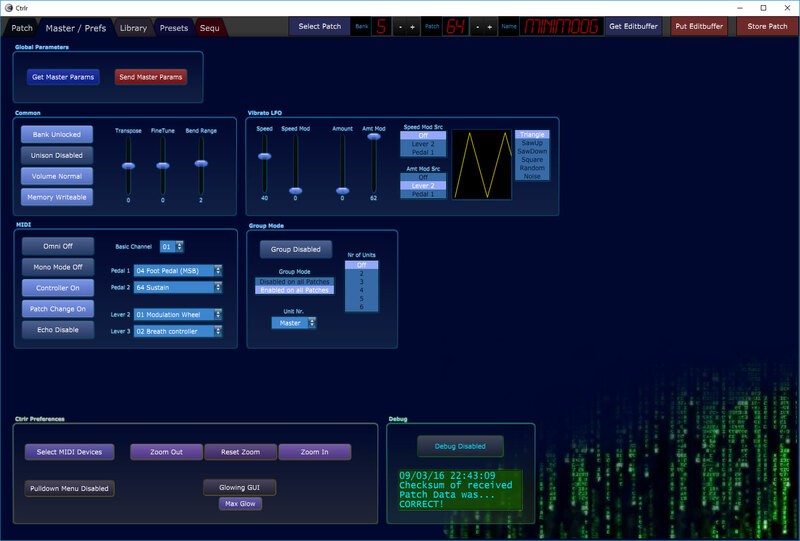 Once again … amazing work (and love the Matrix themed GUI – LOL). P.s. I’m running with Matrix 1000 OS version 1.11 … which EEPROM upgrade is best in your experience to upgrade to? I also have a Matrix 6R which I’ll have a try with next up. I haven’t tried v1.16 from GliGli. All I can say is that v1.20 from Bob Grieb is great. A true game changer. For the M6r I’d recommend v2.14 from Bob. It seems to work well on Matt’s M6. For the patch change issue etc. 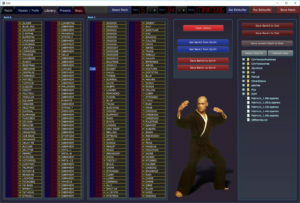 : try the new panel version 1.07b. There are some patch change related bugs fixed. Fantastic work, Possemo, working absolutely great here with 1.16. Thanks a lot! Thanks, Good to know that it works with v1.16 as well. I tried to reach you via your email – to no avail. You must use the latest Ctrlr Mac build: http://ctrlr.org/nightly/Ctrlr-5.3.198.dmg. In the Library section there are buttons for saving patch to disk and banks to disk. It they don’t work this is probably due to the outdated version of Ctrlr you are using. Ah, so you wanted to save to synth. Yes then check if write protection is on. What’s the latest build of your panel? I’m about to get the new firmware and then use yours, looks amaizing but i cannot find the link. Thanks in advance! As described above: This panel has to be requested. Write an email to roet32(at)gmail.com. Give a short explanation why you want this panel. Hi, I would like to use your panel as I own a Matrix 1000. I have attempted to purchase the Eprom from the guy in Germany but his send box is greyed out, could you check this out please…..cheers. Hi Mickymoog, just reading this by sheer chance – my WP installation is damaged, sorry about that; it keeps mistaking users for spammers. You might just mail me via shop at untergeek de and I’ll be able to help you.